The world of supercars is often associated with scissor doors and a color palette shared with the Jelly Belly factory. Cars like this have styling which will make your jaw drop each time you catch a glance, or you’ll roll your eyes as you wonder where the shoot for a rap video is about to take place. 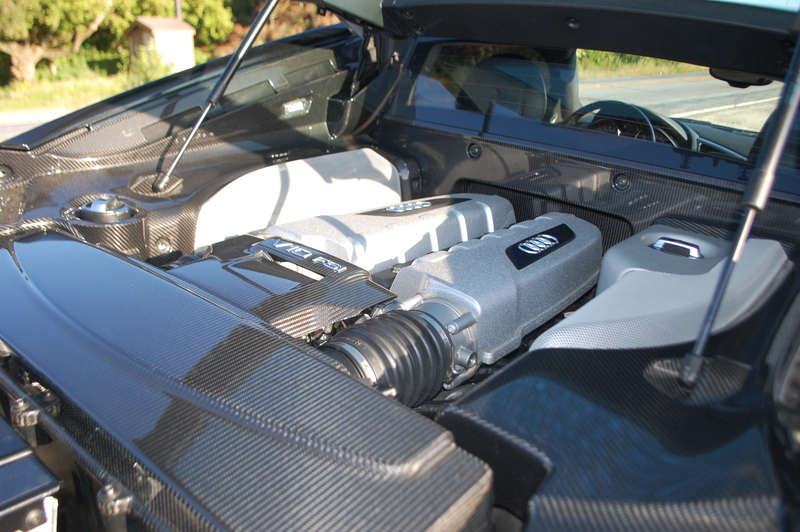 More importantly are the exotic engines with piston counts of ten and above. They produce extreme amounts of power and have temperamental reliability. 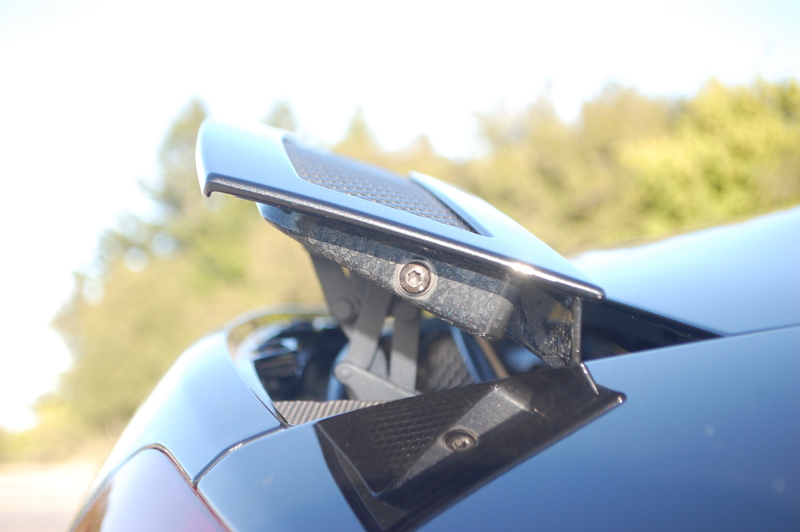 Driving a supercar has always been a severe compromise of practicality for the sake of form and speed. Then Audi decided that didn’t have to be the case. Toss in a few downshifts for background music, and you feel like you’ve landed a fighter jet. When the R8 was launched stateside for 2008, it was a far cry from the AWD sport sedans that the brand had built much of its success off of. 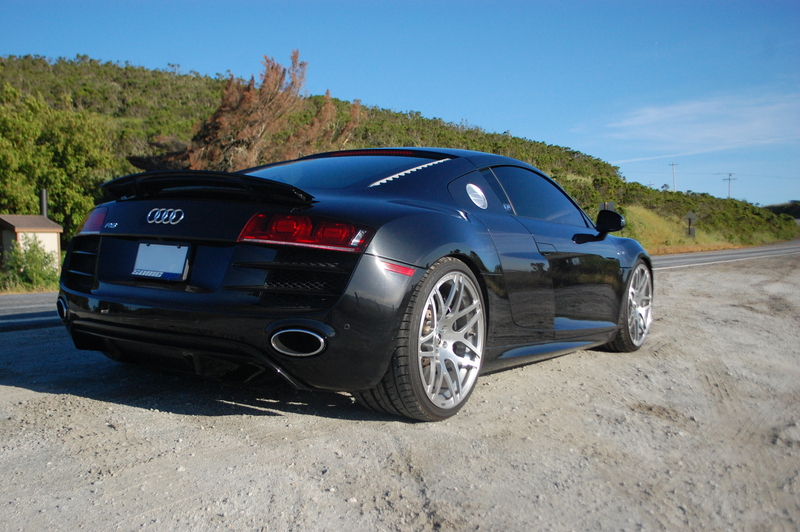 Initially the R8 was available with a 4.2 liter V8 shared with the RS4 sedan, good for a healthy 414 horsepower. Not bad for Audi’s first serious two seater sports car (sorry, the TT doesn’t cut it by comparison), but stiff competition meant the R8 was going to be a one trick pony if it didn’t up the ante. With Lamborghini part of the VW-Audi empire, 2009 was the year that the R8 could elevate itself to bonafide supercar status. 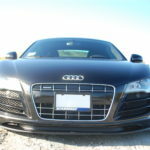 This particular R8 is a 2011 example. 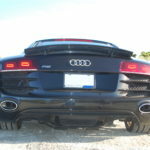 It has the 5.2 liter V10 as found in the Lamborghini Gallardo, and is equipped with the robotized 6-speed known as Audi R-Tronic. With 525 horsepower and nearly 400 lb-ft. of torque on tap, the V10 R8 is a completely different animal than its V8 sibling. In fairness the R8 is mechanically similar (if not identical in certain regards) to the previous gen baby Lambo, but that’s exactly what was needed to make the R8 something special. Stylish Forgiato wheels let you admire the massive brake hardware underneath. In case you forget what car you’re filling up. 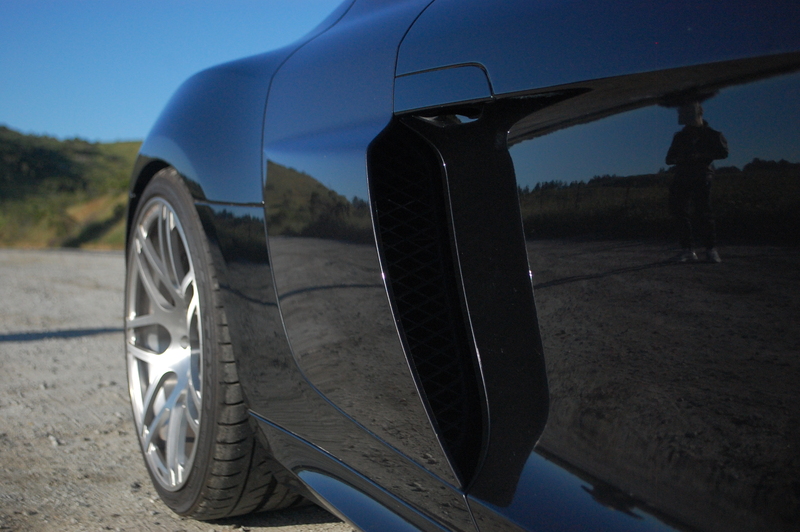 Unlike the angular proportions of the Gallardo, the R8 is full of curves that look form fitted over the chassis. If anything, the exterior styling presents itself as understated, especially dressed in Phantom Black Pearl as seen here. But this is Audi, and the fact they decided to produce a mid-engine supercar is marvel in itself. As to be expected with any supercar, the chassis sits very low, so it’s a bit of a process climbing into car, but large doors give you the real estate needed to contort yourself into the seats. 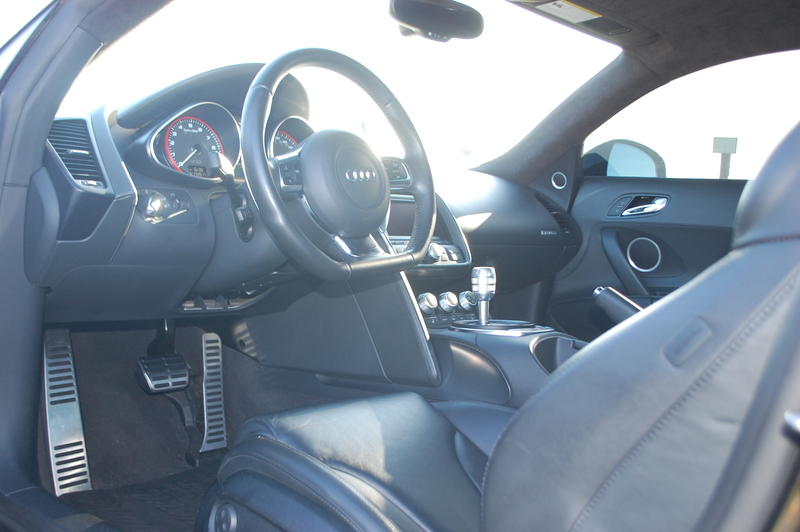 Once seated, there is a surprising amount of space within the R8’s cabin. The bucket seats are very comfortable and the bolstering is not overly intrusive for a car of this nature. 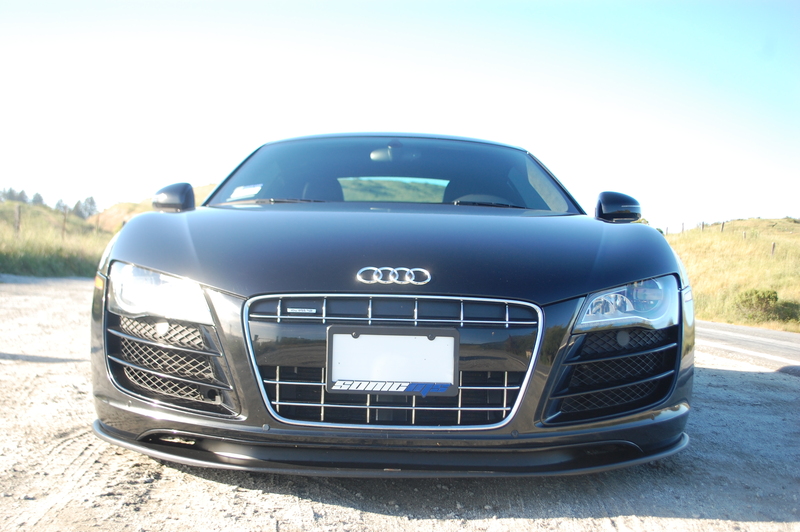 With an all black interior as with this R8, it takes a careful eye to notice the Extended Leather package, which adds additional leather to the dash and upper door cards. When new, this was a hefty $5000 option on some models, but it really does bring the interior to the next level. 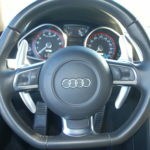 Since this is a German car, the controls are presented logically and within easy reach of the driver. With a sloping dash, the R8’s dash layout is reminiscent of the original NSX, but the switchgear and aluminum accents are quick to remind you this is all Audi. The only bits that present themselves as supercar brash are the flat bottomed steering wheel and the gauge cluster. Perhaps this is where the Italians had some input. Headroom is ample for people over 6 feet because there’s no sunroof cassette. 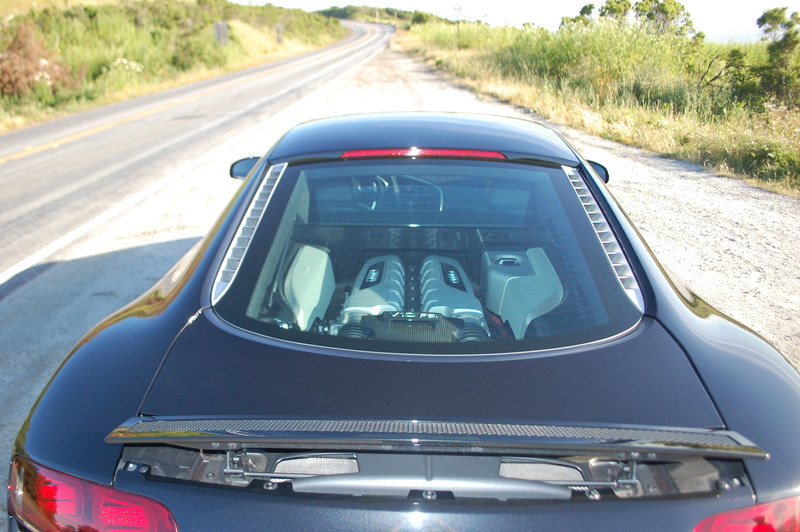 At first I was disappointed that a such a high end car like the R8 didn’t have a sunroof, but it was later explained to me that this was done intentionally in the name of structural rigidity. I suppose there’s always the R8 Spyder for the sun seekers. Extended leather makes looking at the interior just as nice as it is to sit in. 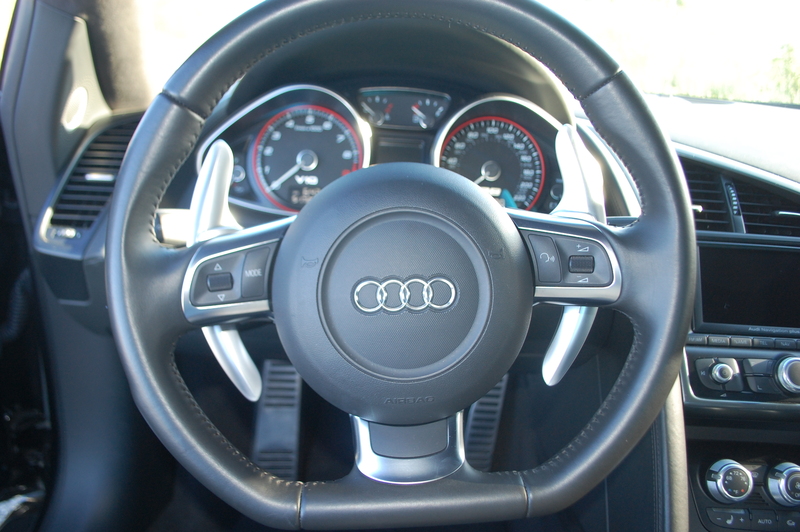 The flat-bottomed steering wheel has become an Audi styling cue. The aftermarket extended paddle shifters make gear changes even easier. 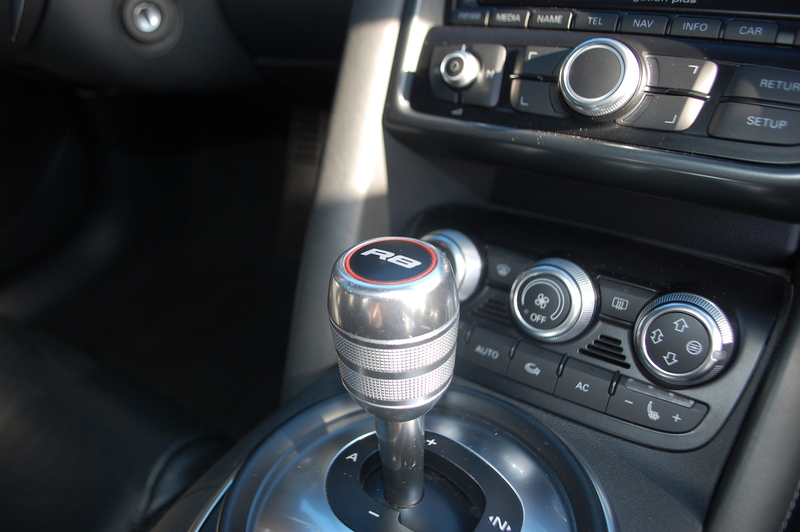 The R-Tronic is an automated clutch-type manual, so it takes a bit of getting used to. 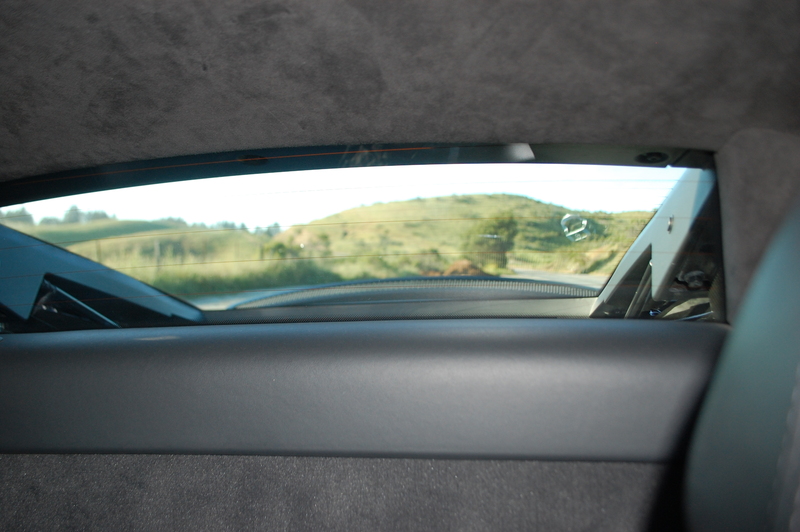 Rear visibility isn’t as bad as you’d think, but the back up camera is without a doubt handy. 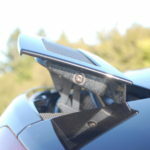 The rear spoiler is set to go up at freeway speeds to keep the R8 planted to the road. Beneath the glass engine cover sits the heart of the beast. Whether you’re driving the car or a spectator from a far, the 5.2 V10 is on display for all to see and hear. Firing up the engine is a noisy affair, but the cold start produces all sorts of great sound effects that are well worth waking the neighbors. 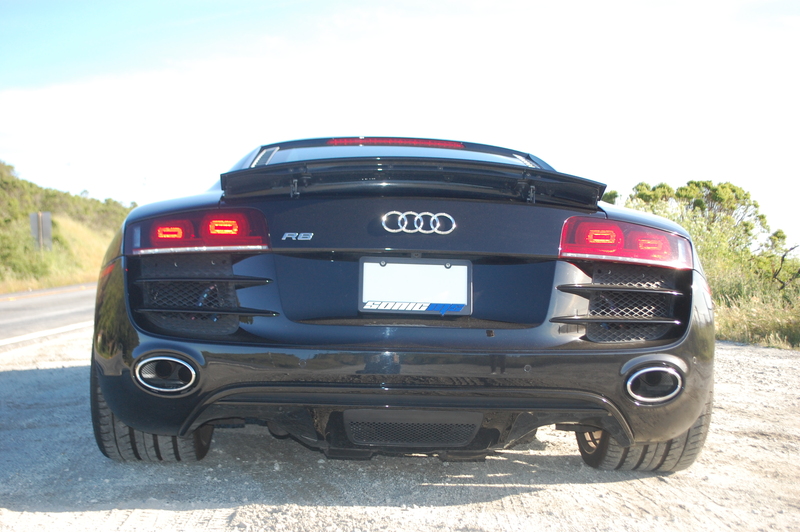 It should be noted this R8 has an aftermarket exhaust, so things get extra loud once the flood gates are opened. Getting the R8 moving requires a bit of finesse. The R-Tronic transmission slips like a conventional manual does when engaging the clutch. Jab the throttle too quickly and the car will buck like a bronco, so you have to be ginger with initial inputs. Once on the roll, the R8 is easy to drive. Equipped with the magnetic suspension, the ride quality is superb. There is a certain stiffness to be expected with a car such as this, but the R8’s ability to soak up bumps is very impressive. Press the button just below shifter, and you can engage the suspension’s sport mode. To be fair, this mode is probably best suited for a track, but certainly manageable on freshly paved sections of road. To truly understand a car like the R8, you have to leave the streets of suburbia behind. Once you’ve found enough space to run through the gears, hang on! The power delivery is seamless as g-forces exponentially increase, planting you harder into the seats. 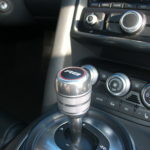 Exercise the tach to its 8700 RPM redline, and you’ll reach triple digits in just a couple of gear changes. A Valentine V1 is looking pretty good right about now. 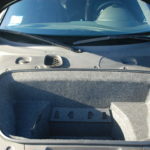 Not exactly roomy, but the front storage space is workable. 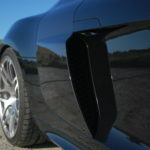 More pronounced side blades are a sign this is a V10 model. …or you can just read the badge. 5.2 liters of Lamborghini in disguise. 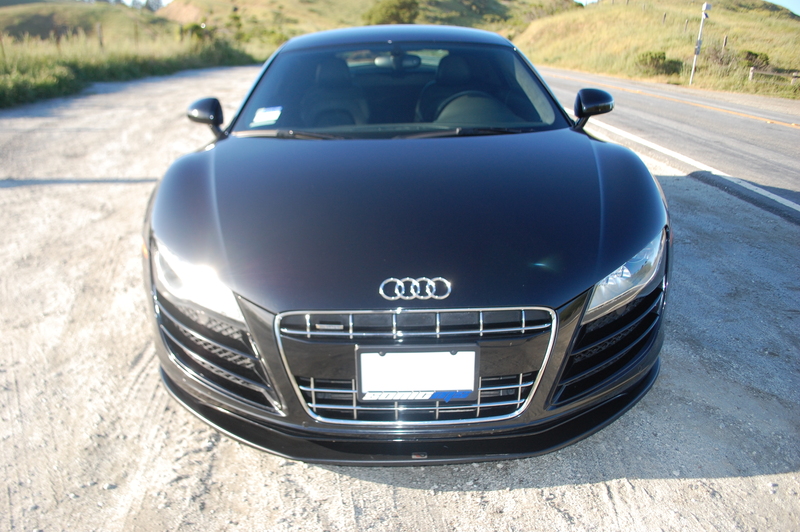 Throw the R8 into a sweeping bend and the 3700lb exotic glues itself to the road. You’d think the staggered (albeit slightly wider than stock) 325mm/245mm 20 inch tires would induce understeer, but they grip well past the point of your cheeks being pinned to the glass. Audi’s Quattro system is one of the best, and this is no exception. While the grip levels are absurd, what’s more astonishing is how easy the R8 is to drive. The steering feel is perfectly weighted. 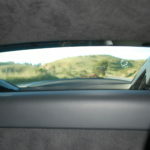 Inputs are made deliberately, but you never feel as though you’re fighting to keep the car pointed in any one direction. 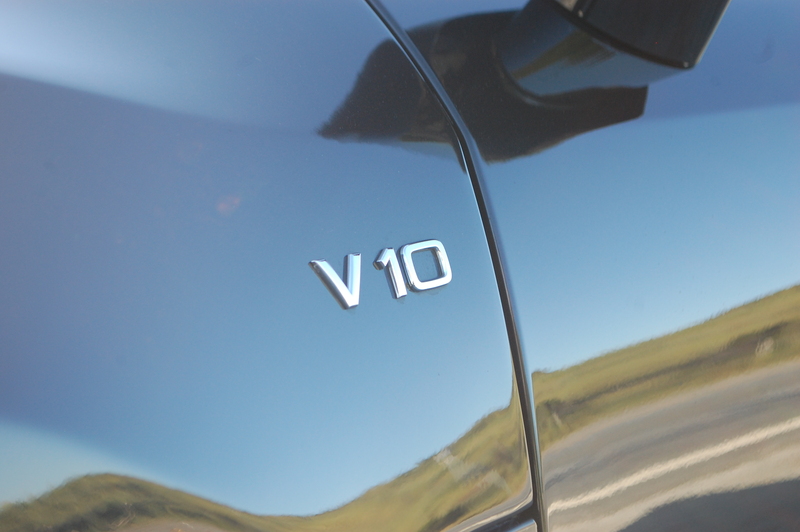 Simply point the car where you need to go, apply the accelerator, and let the V10 take it from there. Once it’s time to slow your roll, massive 8-piston front, 4-piston rear Brembo calipers grab the R8 by the neck and halt the car right then and there. Toss in a few downshifts for background music, and you feel like you’ve landed a fighter jet. With 365mm rotors up front and 355mm out back, the braking system is intended to slow the R8 from Autobahn speeds, so hard stops on the street are a walk in the park. 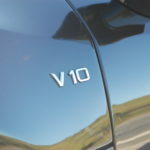 The V10 sits off-center to make way for the AWD. There is never a bad angle. Let’s face it though, the Lamborghini Gallardo and Ferrari 458 steal the styling spotlight among the contemporary exotics. 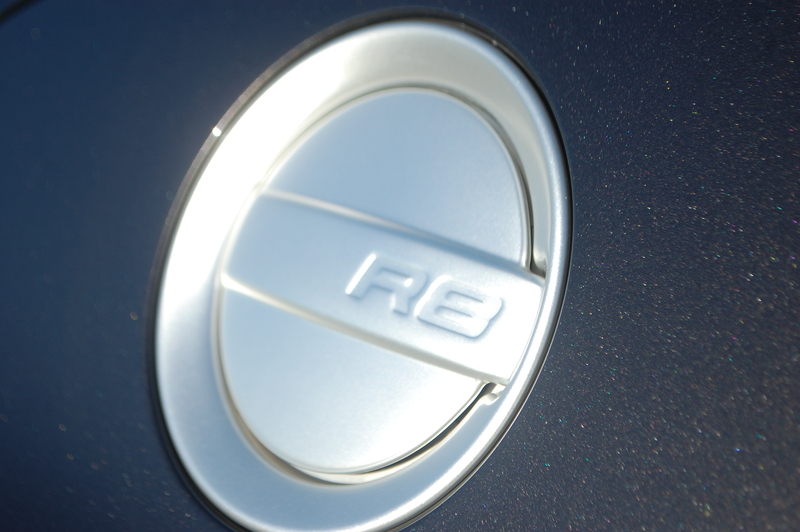 As a result, the R8 sometimes goes unnoticed, and that’s perfectly fine. The person who buys an R8 does so deliberately. There are other options out there, but they appreciate the Audi’s subdued nature. It’s for the discerning individual who enjoys the exotic drivetrain, yet doesn’t strive for as much attention. Enthusiasts will be quick to point out an R8, but someone going about their business will think it’s just another high end luxury car. Arguably you could buy a Porsche 911 for the same reasons, however that would be the obvious choice, would it not? 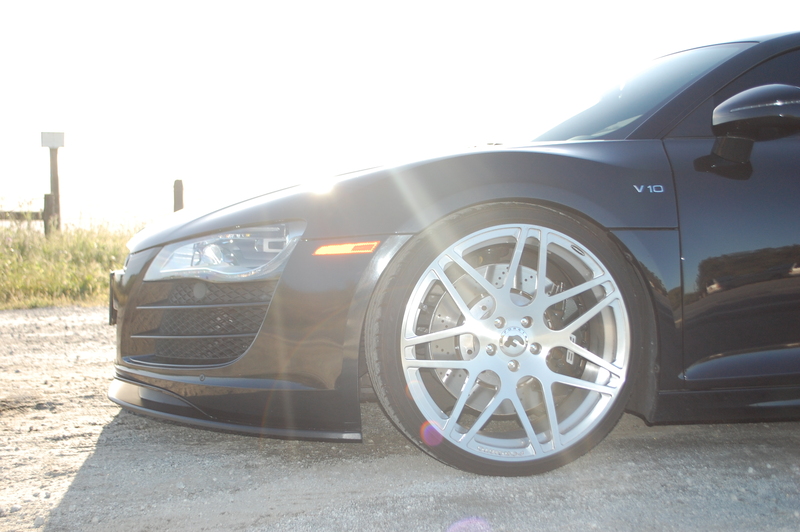 Unlike the boisterous Italian exotics, the R8 has to wear many hats. Not only is it a 195 mph stormer, but occasionally it will have to carry someone to to a business meeting, or a formal evening out on the town. 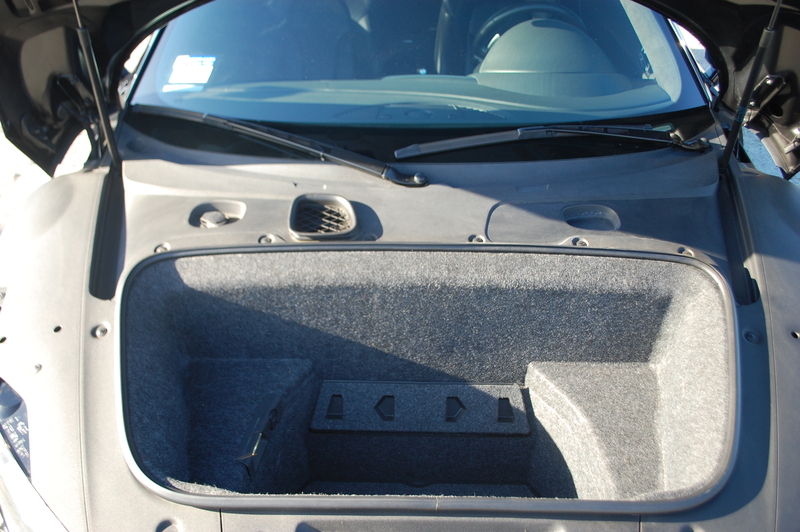 Not that you’re going to load the R8 with a Thanksgiving dinner for twelve, but the bit of space in the “frunk” is enough for a weekend’s stay in Tahoe. With all-wheel drive, Chain Control might even wave you through. Of course there are better vehicles individually suited for each those tasks, but do them in a V10 R8, and you’re guaranteed to have an adventure. Just avoid any and all steep driveways. 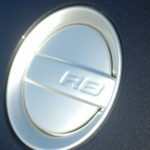 Thanks to Kyle for sharing his car for this article.